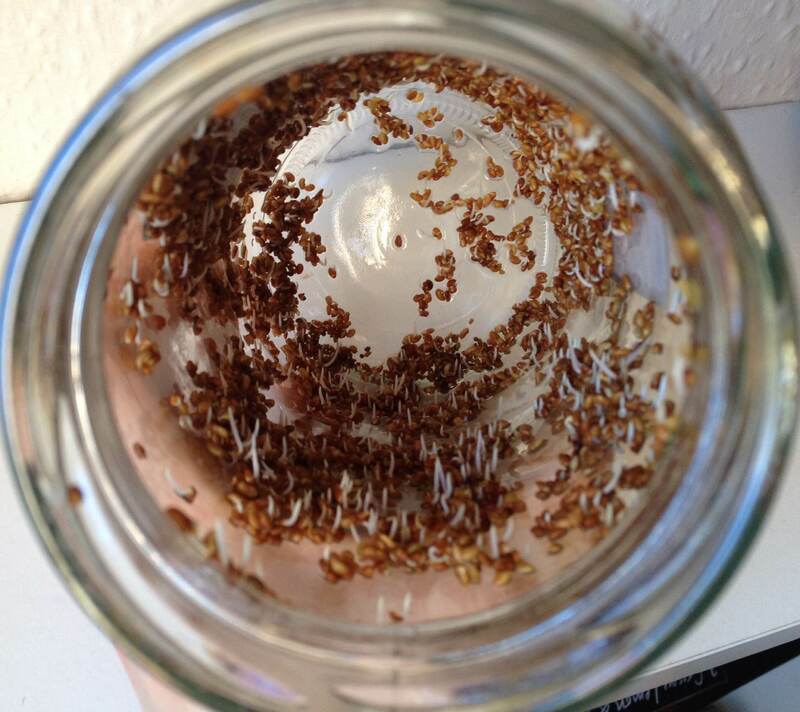 Some of you might remember my first (and only) sprouting experience last summer, that actually went quite well. 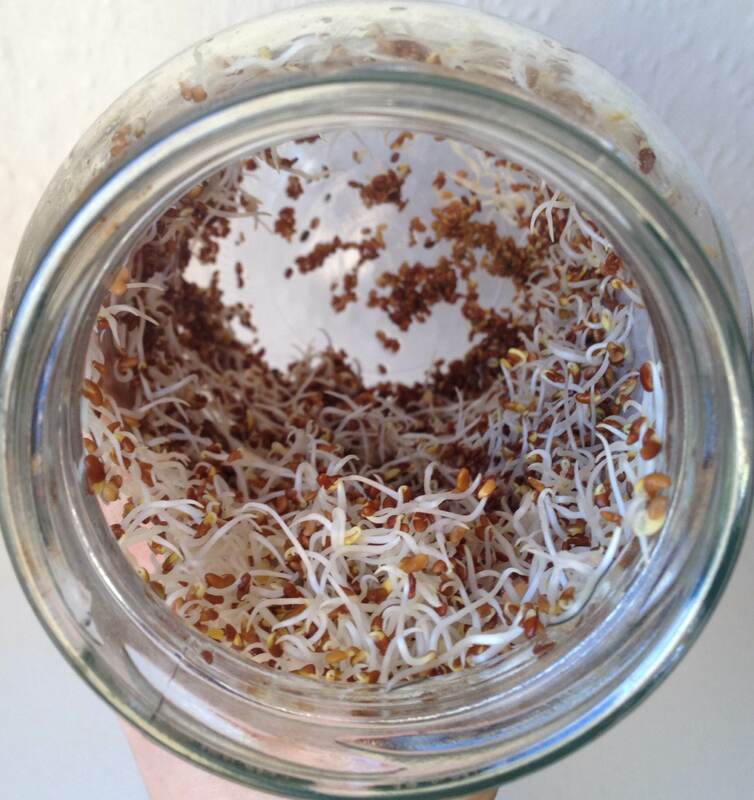 I really enjoyed watching the sprouts grow (not literally), so I thought I’d give it another go – this time with tiny alfalfa seeds. Two attempts later I think I’ve got it. If you want to grow your own little chlorophyll wonders, here’s a short guide to how to do it. First you need to buy sprouting seeds – seeds that have been specifically produced for sprouting – these should be clean and not have any nasty germs in them. I bought mine from Real Foods on Broughton street. Just a small bag will go a long way. Start by measuring a tablespoon’s worth of seeds, rinse them, and try to pick out any seeds that look dodgy. Then, get a flat-sided glass jar (I’ve just used an old olive jar, but you can buy special sprouting jars too), cover the seeds with lukewarm water and let them soak for at least 12 hours. Cover the jar with clean pantyhose (or cheesecloth) and use a rubber band to keep it in place – this will make it easier to rinse the seeds. After soaking the seeds for 12ish hours, rinse them again and drain the water – always use lukewarm water. 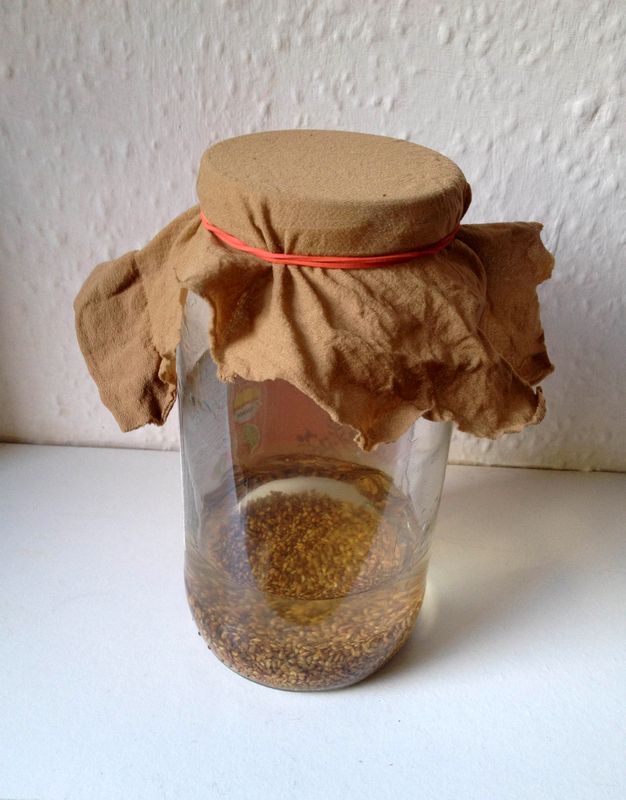 Try to spread the seeds out (I used a knife to do it) so that they can grow in peace, and put the jar on its side in a dark pantry or closet that isn’t too draughty or cold. As you can see I’ve put the lid on – but I’ve pierced it a few times with a knife so that there is a little ventilation in the jar and the seeds won’t start rotting. Keep rinsing and draining the seeds with lukewarm water every morning and evening for around 5 days (this can vary though), and place the jar back in the pantry on its side. Remember to spread the seeds out! On day 3 the seeds finally started to grow, how exciting! On day 4 there is even more action going on in the jar. On day 5 we’re nearly there. 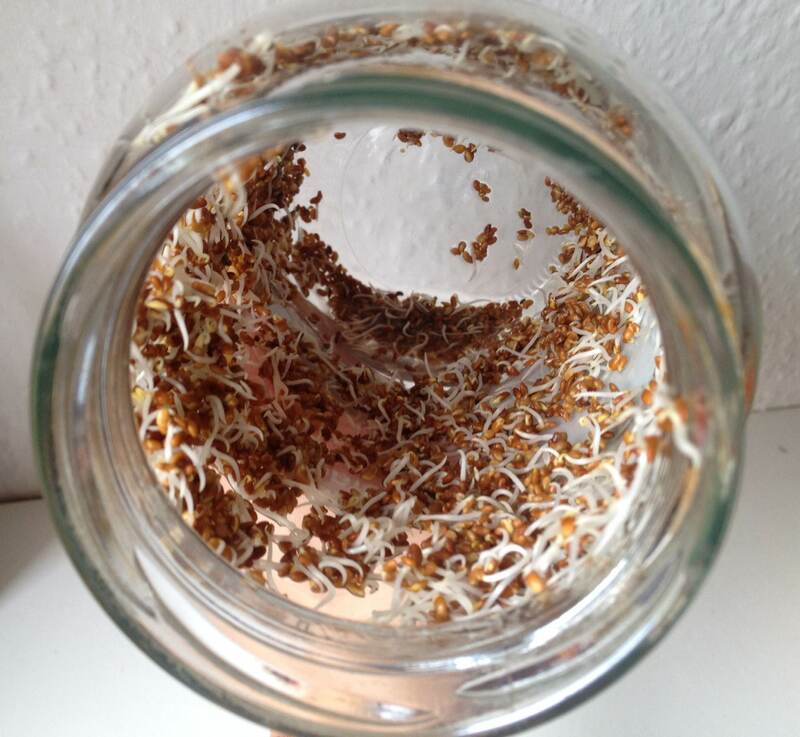 When the sprouts get to 2-2,5 cm (around 1 inch) they are ready to spend a day in the sun. So on day 6 I put them on the windowsill and let the sun fill them with chlorophyll. When they turn green, they are ready to eat. And here they are, crunchy and fresh! Is it not amazing how quickly a bunch of minuscule seeds turned into something edible?? I like to put sprouts on my sandwich and in salads, or just sprinkle them over any food basically. Store the sprouts in the refrigerator, and they’ll be good to eat for up to a week! Do remember to keep smelling the sprouts during the sprouting process, if they smell foul they have most likely started rotting. So rinse often and make sure you drain well before putting the jar back in the pantry.